Trillium texanum , a pedicillate wakerobin, in our conservation collection. In many cooler parts of the country, trilliums are the heralds of spring in the woodland garden, with their beautifully patterned leaves and striking flowers serving as a cheerful farewell to winter. Many gardeners are surprised to find that we are able to grow various Trillium species in our climate. Even more surprising to them is the fact that there are several species that are native to the woodlands of east Texas. There are, in fact, quite a few other species perfectly adapted to the Gulf Coast climate with native ranges from the coastal plain of Louisiana through northern Florida. These southern species are still deemed difficult to impossible by savvy local gardeners who have tried them. However, If specific requirements are taken into consideration, they are not too difficult and can even naturalize in the woodland gardens in our region. Often referred to as “wakerobins” and “toadshades,” the latter common name usually refers to the mostly northern types that have flowers held on a noticeable stalk (pedicile), which in some species arches downward below the leaves, and in others holds the flowers proudly upright. Their leaves are solid green. These wakerobins are more technically known as “pedicilate” flowered species. Most of the southern species we can grow in our region are the “sessile” flowered toadshades which have a stalkless flower fixed in the center of the three leaves, with the petals held erect. 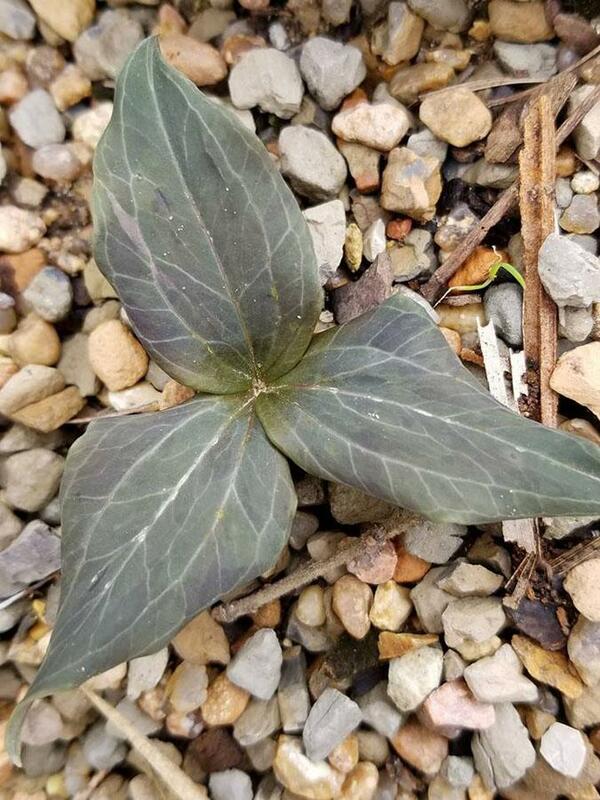 Unlike the wakerobins, toadshades’ leaves are in most cases decorated with ornate mottling of various purple, silver and green tones, ornamental to the point that the foliage rivals their flowers. Nearly all of the options found from Texas to Florida have the same general requirements that have been learned through my own trial and error, experiences of others, and by observations made in their natural habitat. In the wild, most southern species, with a few exceptions, are always growing on moist but well-drained ravine slopes in soil that tends to be neutral to alkaline. In the garden, planting in a level garden bed, even if well-drained, usually results in the plants being unhappy, returning every year smaller and smaller and eventually disappearing. Simply building a small berm of good quality soil even 18” – 24” high can drastically improve results. Planted in the pockets of soil among a shady rock garden also can work. 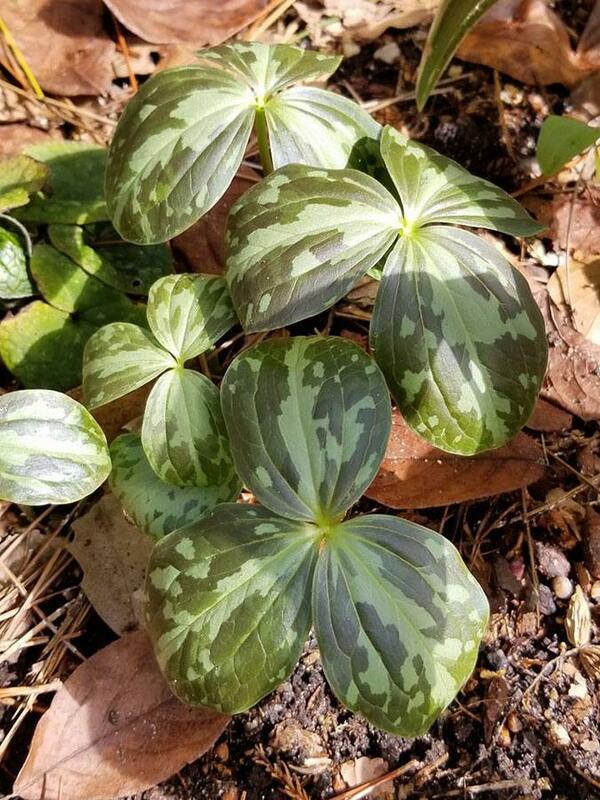 Though southern trilliums can handle acidic soil, they seem to do even better with annual additions of horticultural lime. I would mix this into the soil when planting, and every year I would scatter a liberal amount on the surface to be washed in. 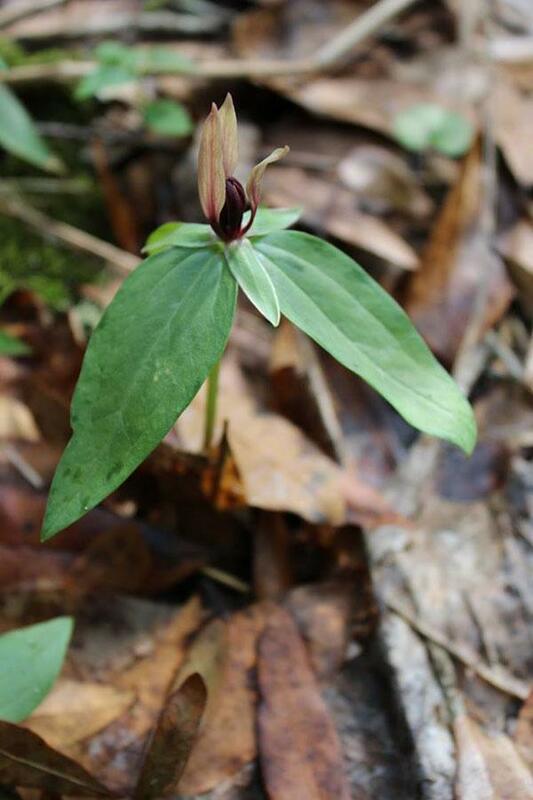 Though generally thought of as spring ephemerals, southern trillium species can emerge late fall or in the dead of winter. This can be as early as Thanksgiving in the north Florida species to February among the remainder of the species found along the Gulf Coast. Their emergence coincides with the increased light reaching the forest floor after the deciduous trees have dropped their leaves. In our region, they can only tolerate a few hours of direct sun in the morning, with dappled shade the remainder of the day. Trillum lancifolium ‘Ballerina’, a Plant Delights selection with pewter foliage. By early summer, trilliums are getting ready to die back for the season. Their foliage can look quite disheveled by May or June, but, as with most geophytes, resist the temptation to cut it back before it dries entirely to encourage a more vigorous plant the following season. As long as any green remains on the tattered foliage, it is supplying more energy to be stored in its underground rhizome. Even after the foliage disappears, occasional watering of the soil during extended dry spells is necessary. Trilliums aren’t like other geophytes (bulbs, corms, rhizomes, tubers) in that their rhizomes don’t actually go dormant. Instead, their rhizomes are growing and branching underground during the summer when no leaves are present. If the soil dries considerably during the summer, it can result in a stunted plant the following season, or a complete loss. Though formerly rare in mail-order nurseries, a few businesses are delving into the southern species. Tony Avent and staff at Plant Delights Nursery have been leading the way and are an excellent source for a variety of species and selections. The prices may seem steep, but when you consider that a trillium from seed takes 5-7 years in even the best nursery conditions to attain a reasonable salable, flowering size, it makes better sense. Tony has been collecting a variety of unusual variants of the species ranging from pure silver leaf forms, atypical patterning or growth habit, and unusual flower colors. It is best to stick with reputable nurseries and avoid wild-collected plants that can sometimes be found at low prices online, as these are often unethically collected from sensitive environments. Trilliums can be very tricky in pots long-term. If you need to keep them containerized, it is recommended to use a very open, freely draining mix, and repot in new soil annually. If not regularly repotted, the soil can break down creating a thick muddy layer around the bottom of the pots that can result in a rotting rhizome. Even in pots, they never are as vigorous as they are in a proper garden setting. 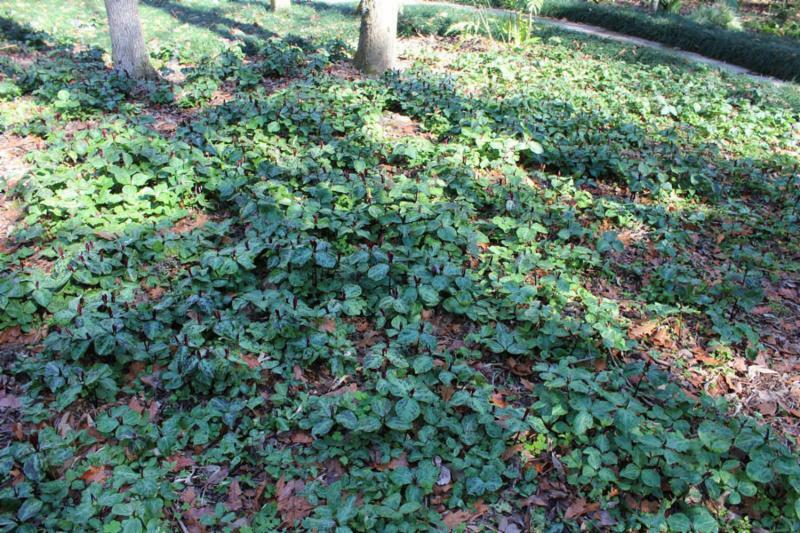 What can be accomplished over a few decades – a huge patch ofTrillium maculatum at Kanapaha Botanical Gardens in Gainesville FL. If you are ready to be the envy of your gardening friends and try your luck with trilliums, I would recommend the following species for beginners: T. gracile (Texas native), T. underwoodii,T. maculatum, T. decipiens, T. lancifolia, T. ludovicianum, T. foetidissimum and T. oostingii. These are all the sessile-flowered toadshade types. There are few pedicillate-flowered wakerobin types suitable for our region. A couple of more northerly species reach their southern extent in the coastal plain, but plants collected specifically from these isolated, southernmost populations would be needed to succeed, and aren’t present in cultivation yet. T. texanum, a rare bog-growing species known from only a few sites in east central Texas, is a pedicillate species we are trying to conserve at Peckerwood that is not available from nurseries. 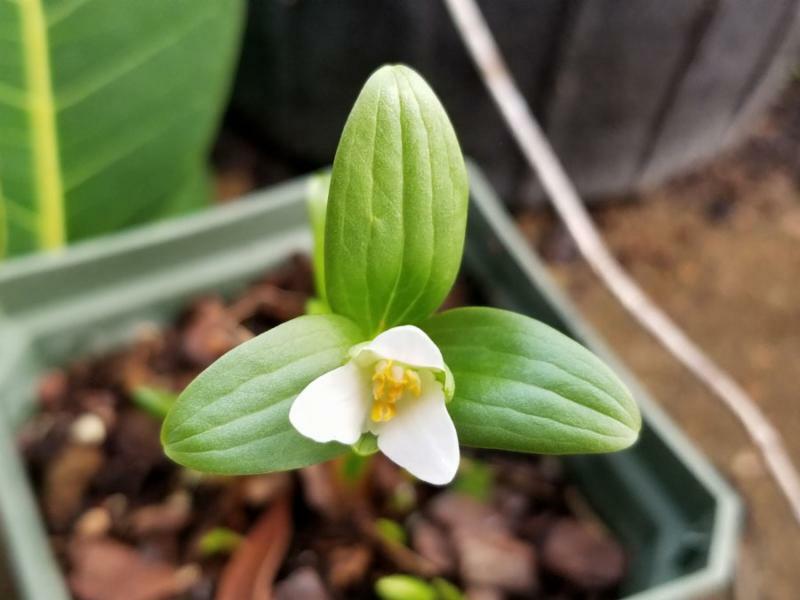 Peckerwood will be offering limited numbers of several species of trilliums this spring, including T. maculatum from Florida, T. gracile from Texas, and T. foetidissimum.